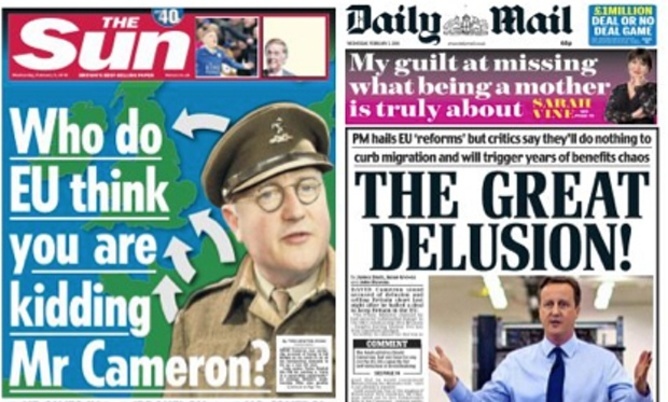 We’re all doomed – The Tory press and the EU referendum. This is the first time since 2014 that the Brexit camp has been ahead in the polls and, coincidentally, comes just a couple of days after prime minister David Cameron and European Council president Donald Tusk unveiled their draft deal on EU reform. As you’d expect, the more right-wing elements of the British press reacted colourfully and vehemently to Cameron’s assertion that the deal would yield “substantial changes” to the status quo. Wednesday’s Sun typically drew on the current publicity around the recent film version of Dad’s Army to portray the prime minister as a hapless Captain Mainwaring. The front page headline was a play on the lyrics of the show’s famous theme tune, while white arrows of invasion made their way across the English Channel. That the allusion doesn’t really work – Mainwaring stood steadfastly against invasion, of course – is really not the point. We were meant to think of Cameron as a pompous nincompoop presiding over a farce. There was no getting away from it, the editorial thundered, his “renegotiation” with Brussels has produced a “steaming pile of manure”. It is a dismal failure worse than we ever imagined. It will not improve one aspect of British life. It will achieve nothing whatsoever on the two central problems it was meant to tackle: our out-of-control immigration and the erosion of British powers by the EU. Brussels, not for the first time, has treated us with contempt and given us the square root of diddly-squat. The Express continued in the derisory vein, proclaiming on its front page that “CAMERON’S EU DEAL IS A JOKE”, while the Daily Mail exclaimed that the deal would do nothing to curb immigration and would trigger years of benefit chaos. It was, said its front page, “THE GREAT DELUSION”. 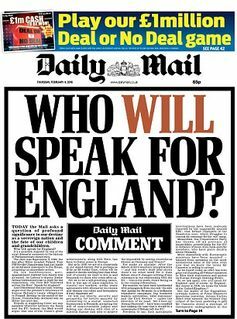 By Thursday the Mail was in siege mode, pleading on a front page (given added gravitas by the fact that it eschewed visual imagery and reference to either celebrity or a health story): WHO WILL SPEAK FOR ENGLAND? 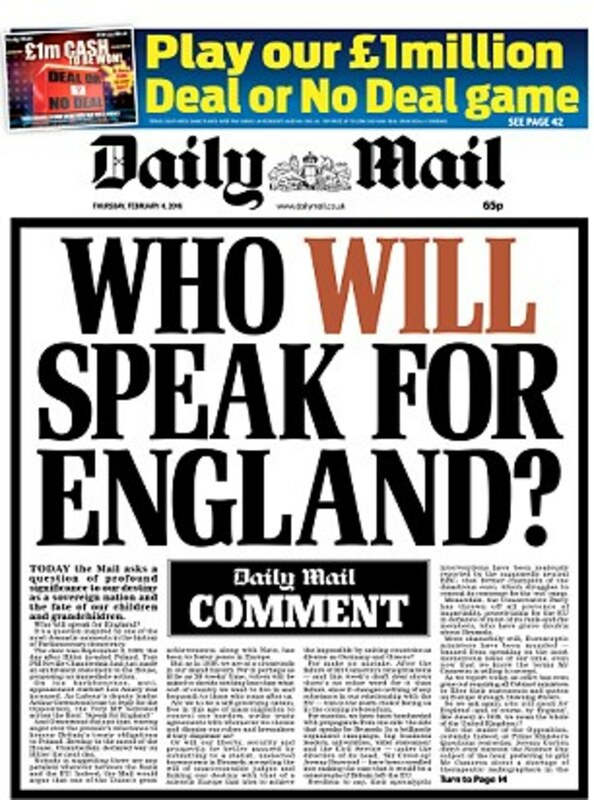 In this scathing comment piece, the Mail asked if England (Britain!) was to be a self-governing nation free to control its borders? Or would liberty, security and prosperity be better assured by submitting to a statist, unelected bureaucracy in Brussels? This was the stark question “after the failure of Mr Cameron’s renegotiations”. In the Guardian, meanwhile, Polly Toynbee predictably argued that the right-wing press should not be allowed to “bully us out of the EU”. Reigniting the debate over how much power the press actually has in today’s political landscape, Toynbee stated that despite falling sales newspapers still set the agenda. It’s fair to say that historically the press has had the ear of politicians on European issues and influenced behaviour. Benjamin Hawkins argued in 2012 that the eurosceptic discourse of the Mail, Telegraph and Sun, framing the EU under the themes of “separation and subjugation by powerful outside forces”, had had an impact on the policies of British governments in dealing with their European partners. In 2002, Chris Horrie wrote that one of the reasons why Tony Blair did not fully immerse himself in the campaign for the euro was because of his fear of “upsetting the UK’s ferociously anti-European press”. More pertinently Lance Price, Blair’s former spin doctor, told the Today programme in 2011 that the area where Murdoch’s influence over the PM was most felt was European policy. According to Price, Labour “promised” News International that there would be no changes in policy without talking to them first. Then there’s former Conservative prime minister John Major, who told the Leveson enquiry that Murdoch demanded his government change its policy on Europe or his newspapers would oppose him at the 1997 general election. The question as to why the right-wing press is so anti-EU may be partially answered by considering the ideological and business interestsof their owners. Murdoch’s position is well documented. 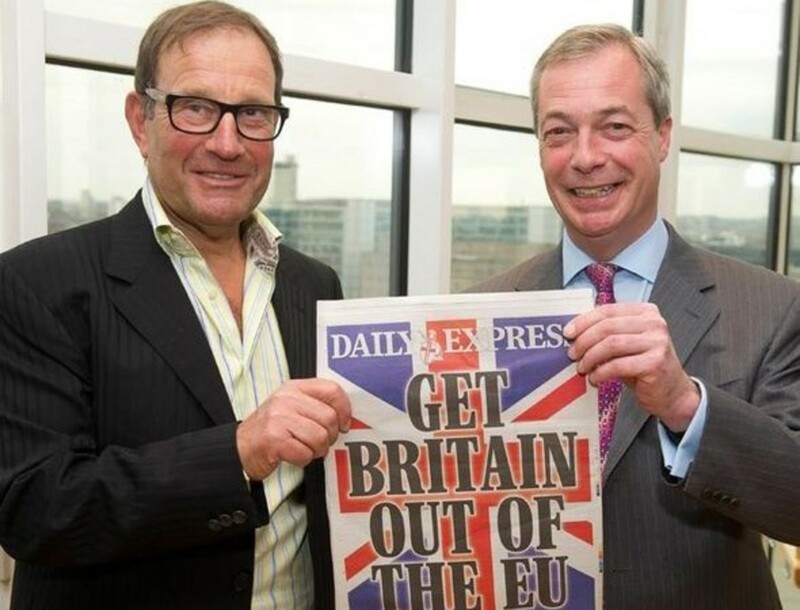 The owners of The Telegraph, the Barclay brothers, turned the European weekly newspaper into a “tabloid-style news magazine with a Eurosceptic vocation” and the endorsement of UKIP by Richard Desmond, owner of the Express and Star, couldn’t be plainer: Consider the image of Desmond and Farage holding an edition of the Express whose front page is a union flag embossed with the slogan: GET BRITAIN OUT OF THE EU. But it is the vitriol with which EU issues are reported in the Tory press that makesmany commentators despair. Reading the Express, Mail or Sun on European issues may leave the reader with the impression that the sole purpose of Brussels is to incrementally destroy British identity. In some of the reporting and analysis there is a barely disguised xenophobia born of a time when Britannia ruled the waves. But ‘twas ever thus – and the question as to whether such an atmosphere will prove to be influential on voter behaviour in the (probable) June referendum is, as ever, extremely difficult to answer. Some, such as the LSE’s Charlie Beckett, counsel against overestimating the power of traditional newspapers. He argues that their role, in the digital world of Buzzfeed and Vice, looks “increasingly partial and probably minor”. But you can bet that in looking at the latest polls, the UK’s press barons will redouble their efforts – and the one thing we can bank on is that there will be no let-up in the intensity of the coverage. ← Here comes the son: Sky’s not the limit for James Murdoch.